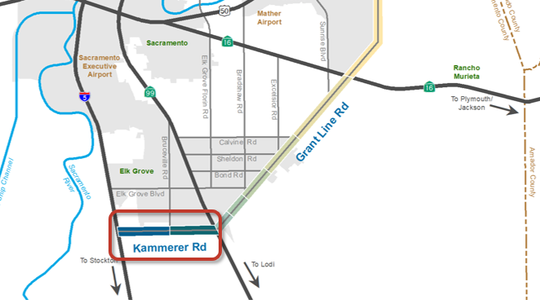 The Capital SouthEast Connector A1/A2 Segment - Kammerer Road Project (Project) is located in unincorporated Sacramento County (County) and a portion of the City of Elk Grove (City). The Project proposes to connect Interstate 5 (I-5) to State Route 99 (SR-99) in an west-east alignment. The Project will construct a new four-lane expressway and implement a railroad grade separation between I-5 and Bruceville Road, and then replace an existing portion of Kammerer Road with a new four-lane thoroughfare. The total length of the Project is approximately 6.5 miles. The Capital SouthEast Connector Joint Powers Authority (Connector JPA) is the California Environmental Quality Act (CEQA) lead agency. The City of Elk Grove and Sacramento County are Responsible Agencies. The California Department of Transportation (Caltrans) is the National Environmental Policy Act (NEPA) lead agency. The Project meets the goals of the Connector JPA Program Environmental Impact Report (PEIR), which was certified in 2012. There is an existing interchange at I-5/Hood-Franklin Road from which the eastern leg of Hood-Franklin Road currently terminates at Franklin Boulevard. Kammerer Road is currently a two-lane undivided roadway which begins at Bruceville Road and extends east to the SR-99 Grant Line Road/Kammerer Interchange. The proposed Project would connect the segments through construction of a four-lane facility, two travel lanes in each direction, with a multi-use path adjacent to the west-bound travel lane. This Project will require utility relocations, right-of-way acquisitions, drainage improvements, temporary construction easements, and staging areas. It should be noted that the PEIR identifies a future project concept including full interchange reconstruction and grade separated intersections; however, these future improvements are not part of the initial Phase 1 improvement plan. The Project is included in the Sacramento Area Council of Government’s (SACOG) 2016 Metropolitan Transportation Plan/Sustainable Communities Strategy (2016 MTP/SCS). The Project is also included in SACOG’s 2017/2020 Metropolitan Transportation Improvement Program (MTIP) as project numbers SAC24114 (SR-99 to Bruceville Road) and SAC24094 (Bruceville Road to I-5) on pages 40 and 42 of Appendix 3 of the MTIP. The Project area needs an east-west evacuation route that is higher than the 100-year flood elevation to enable normal mobility and emergency vehicle access. The purpose of the Project is to improve regional traffic operations, reduce existing and projected congestion, and provide a vital component of the gap closure. Enhancing mobility options within the Project Corridor, including opportunities for improved vehicular, transit, bicycle, and pedestrian movements, as well as emergency vehicle access.